Oh, Imagine. One of River Beats favorite music festivals to attend! Every year, the Iris team does an excellent job of curating a multi-faceted lineup fit to please every lover of electronic music. You like techno music? They got it! Bass music? They got that too! This year doesn’t stray away from this, and highlights even more on musical variety. 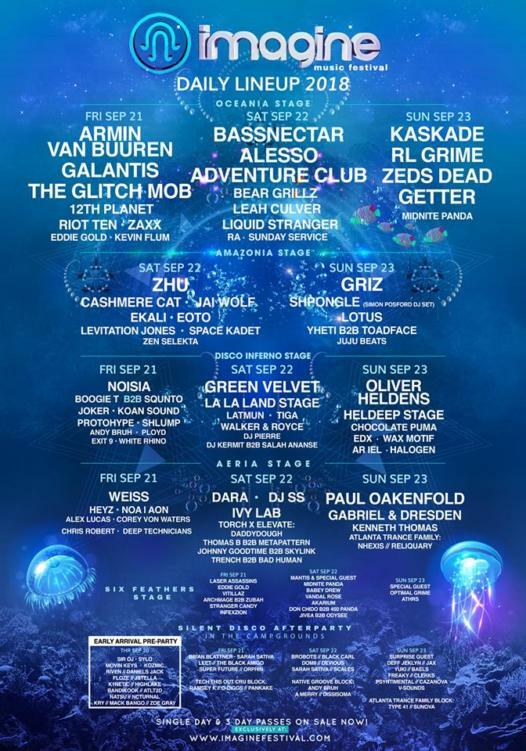 Imagine Music Festival officially opens up on Thursday, September 20 with a pre-party event. On Friday, only 2/3 main stages are up and running with performances from Galantis, The Glitch Mob, 12th Planet, Noisia, Boogie T b2b Squnto, and more. Saturday brings out the big guns with Bassnectar, ZHU, Green Velvet, Walker & Royce, Ivy Lab, and so. much. more. Closing out an epic weekend on Sunday is RL Grime, Zeds Dead, GRiZ, and others. This whole entire weekend is filled with excellent musical artists and we are excited! Featured image via Imagine Facebook page.